Click here to start at my FIRST journal post! Today was a big day. I woke up early, thinking about the day to come. The stars were bright through gaps of the tree canopy. I lay awake for two hours before getting up. Packing seemed ridiculously easy after weeks of packing my kayak. I walked down through the huge trees to the river and watched the sun rise over the misty water. I picked blackberries for breakfast and put out my solar charger to charge my phone enough to rewrite yesterday’s post which had evaporated. At 9 I walked up to the Visitors Center. I tried to pay admission but they refused. Like all the visitors centers they had beautiful displays. Especially interesting were the fates of the members of the Corps. After an hour I headed out on the Fort to Sea Trail, and with five hours to go seven miles, taking a leisurely pace. The trail was very well maintained, wide and firm and not one log across it. Much of the route was timbered but eventually there were fields as well. I found the many ripe blackberries hard to resist. Eventually I could see trees bent by the wind, and then hear the roar of the waves and the smell of the ocean. When I got to the paved road I sat down to wait for my friends. It wasn’t too long before my old smokejumper buddy Mike Fitzpatrick showed up. Man it was great to see him. He’d brought me some really good sandwiches, apples and cookies. As we stood talking our other smokejumper buddy Troop Emonds pulled up. It sure was fun to see those guys, my good, loyal, tough, laughing friends. They walked with me down to the water. Beautiful white waves rolled across the blue Pacific, where I symbolically touched and tasted the salt water. This adventure was everything I hoped it would be. 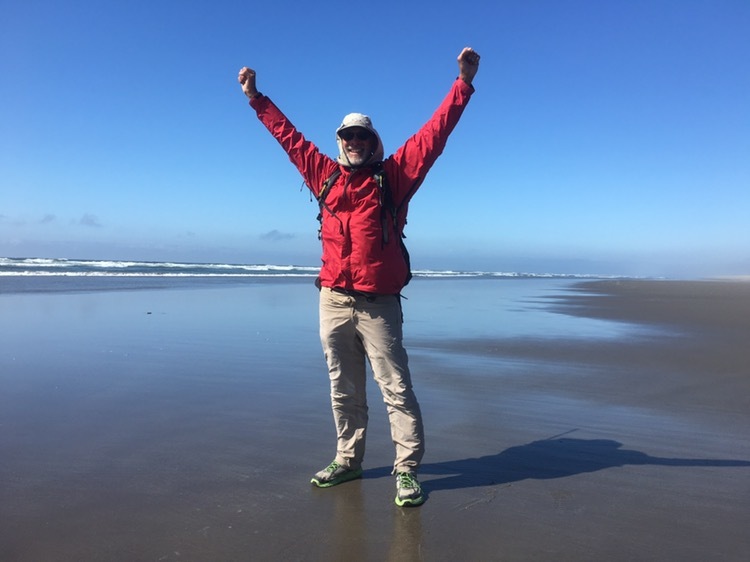 I am happy and lucky to have successfully completed it, to have walked and paddled the trail of Lewis and Clark for nearly six months. September 13, Day 174, Mile 3316, 7 Miles Left! It was a good camp. When I got up the Big Dipper was just above the horizon. Navigation lights blinked along the bay and there was a heavy dew from the sea. The tide had made it within a few feet of my kayak last night but now the edge of the water was nearly 50 feet away. I looked at my map. I’d stay near the south shore to hedge my bets on winds and tide. I launched and paddled steadily with only brief pauses for over three hours. The winds were light and at first tidal currents were minimal. There were many loons and cormorants, mallards, pelicans, seals and a bald eagle. Near Astoria a Sheriff/Coast Guard boat stopped to check that I had a life jacket and gave me a whistle, which apparently is a regulation in Oregon. Very friendly fellows. When I turned the point I hit some significant up-stream tidal currents. At East End boat ramp there were dozens of sea lions, roaring incessantly. There was also a boat ramp. My plan was to paddle to Fort Clatsop. I didn’t know how strong the outgoing tides might get. They would work against me paddling up the Lewis and Clark River. I decided to hedge my bets and land here. I contacted Staci Stainbrook who’d kindly offered to lend me a hand. A reporter and photographer from the Astoria paper came by to do a story on my trip. Staci arrived, friendly and well prepared to haul my kayak. She was a long time firefighter. We took my boating gear to her place and then returned to the launch with my backpack. Thanks Staci! I stopped for a very late lunch and booked a ticket for Fairbanks. I was getting calls and texts and emails from all directions. There was a lot to think about! There was an extremely steep street to hike up in Astoria. It must not get icy here! Yesterday I saw some palm trees and today bamboo. After I crossed the river things got much quieter. A herd of Roosevelt elk were feeding in a field. Then, as I walked along forest, I began to hear bull elk bugling! 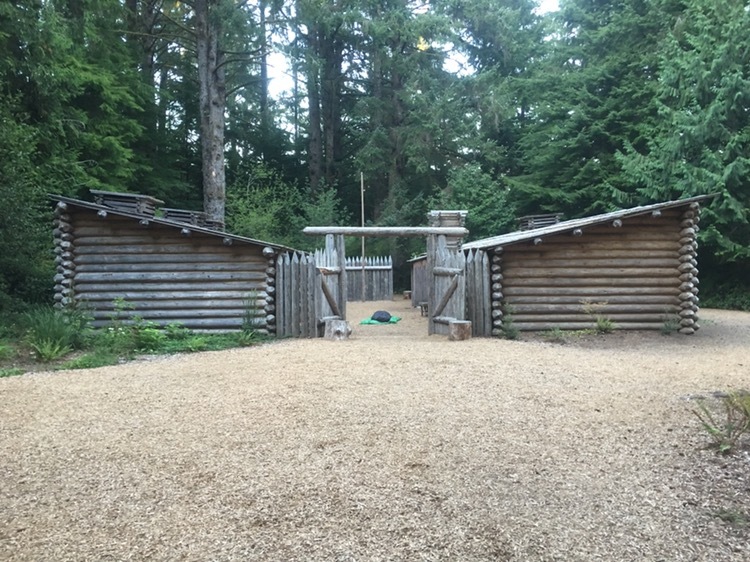 I was supposed to meet the reporter at Fort Clatsop but it was closed. A nice ranger let me in though, and I had a good talk with the staff about my trip and Lewis and Clark. They even let me camp at the fort. Super nice people. Thanks! I will finish my adventure tomorrow with a seven mile walk through the forest to the Pacific, a route the Corps members took many times. Clark: December 1st Sunday 1805… began to rain at Sun Set and Continued half the night. my hunters returned without any thing Saw 2 gang of Elk a disagreeable Situation, men all employed in mending their leather Clothes, Socks &c. and Dressing Some Leather. The Sea which is imedeately in front roars like a repeeted roling thunder and have rored in that way ever Since our arrival in its borders which is now 24 Days Since we arrived in Sight of the Great Western Ocian, I cant Say Pasific as Since I have Seen it, it has been the reverse. September 12, Day 173, 3292 Miles Completed, 31 Left! I could hear the wind in the trees and waves hitting the shore this morning. It made me less excited to get on the river early. Nevertheless I was paddling before sunrise. With predicted north winds I crossed over to the Washington side. There were a few salmon fishermen out, but the river was much, much quieter. Ships were docked in several places. Although there was a brisk wind when I started out it began to die down. At times the tide was helping me a little bit and at times the tide was hindering me but it didn’t make a dramatic difference either way. At times I noticed I was cruising at about 5 miles an hour so I was getting maybe 1 mile an hour gain from the current and tide, I’ll take it! I think maximum gain from current and tide since I passed Bonneville dam is about 2 miles an hour. The minimum is about -1 mph. Several oceangoing ships passed me again today. Looking at the big wave they were pushing in front of them you would think that a poor kayaker would be swamped by them. I found however, that they threw off less of a wave then a powerboat passing nearby. I saw at least two seals and heard one another time that I didn’t spot. There were many cormorants and a few pelicans. This close to the sea obviously most of the shore and hills are covered with trees. I couldn’t help but think back to my smokejumper days looking at some of the trees that must’ve been nearly 150 feet tall, and I was glad that I wasn’t hitting the top of one of them with the parachute. My old smokejumper buddy Andy Anderson gave me a call unexpectedly. Neither of us realized that I had passed his home town area already. Rats! I have Pacific fever now so I only took about three breaks and they were fairly brief. 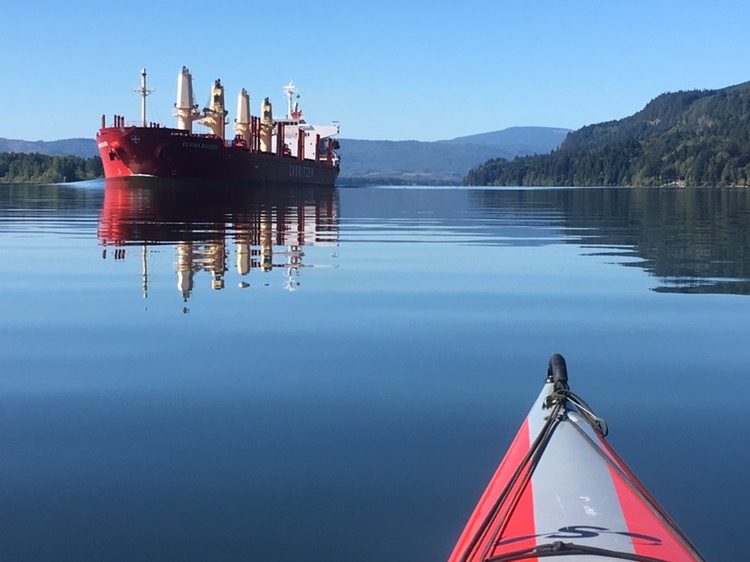 At one spot there was an enormous oceangoing ship’s anchor sitting on shore. It would be fun to know it’s history, it must be valuable as it was still in extremely good shape. For most of the day the wind was very light, only for 45 minutes or so did I have a strong tailwind. Towards evening a side wind came up but it was not much of a factor. Wind, and thinking about wind, has been a very big part of this journey. About 4 PM I slowly rounded a corner and got goosebumps. To the west I could see mountains and islands, and water that extended to the horizon, the Pacific ocean! What a thrill that was. It was a big surprise too. I knew I was over 30 river miles from the ocean so I didn’t think I would be able to see it so soon. Checking out the map there were a series of islands between me and Astoria and the mouth of the river got wider and wider. I decided to follow the south shore so I wouldn’t get caught on the wrong side of the bay by a strong wind. I had come over 40 miles and I was tuckered out. Each of the last two days I’ve also done about 40 miles. Each represented long days of paddling. When I passed an island with nice high ground with big trees, including spruce trees, I decided to camp. There were lots of good camping spots. 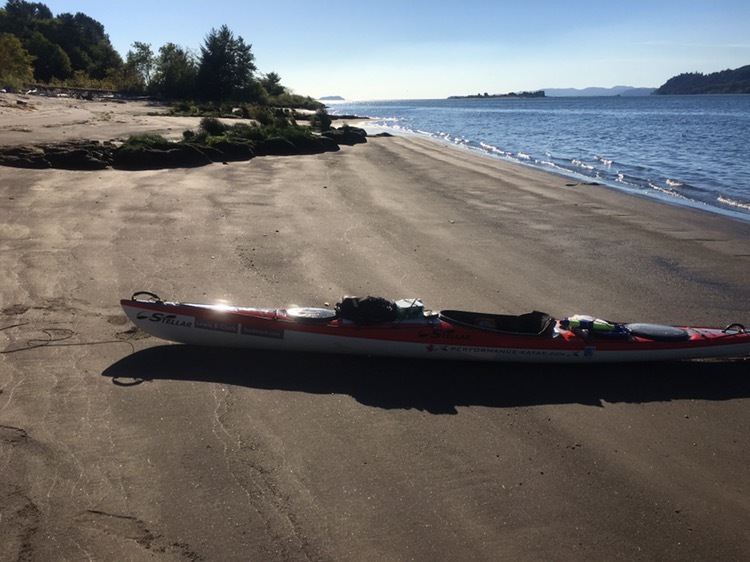 I dragged my kayak up the gently sloping sandy beach until it was above the high tide mark. There I tied it off to a big log.